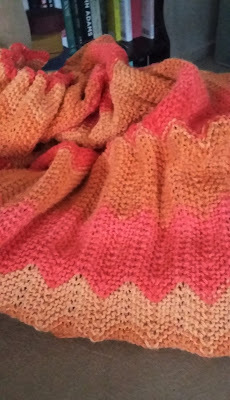 I'm down to the wire on the orange blanket for Sarah. Although the blanket is not a birthday present, I am determined to have it completed before her birthday, November 19th. I'm determined! The never ending orange blanket. I have the awful feeling that if it's not completed by her birthday, it will go into the permanent UFO pile never to be seen again. I've spent way too much time on it and have had way too many nightmares about the color orange to see it go into that pile. I have 13 days and 26 inches more to knit. That's a minimum of two inches per day, every day. Easily doable, right? Right?? You can do, just be faithful to knit each day! And how could orange be a problem? It's just the most dreamy color there is!!! you can do it, I'll cheer you on!